India’s top-order had a terrible outing in the first T20I in Guwahati as they were defeated by England by 41 runs to go 1-0 down in the three-match series. Earlier in the game, Tammy Beaumont’s 62 and Heather Knight’s quick-fire 40 powered the visitors to a total of 160/4 in 20 overs. Brief Score : England 160/4 (Tammy Beaumont 62, Heather Knight 40; Radha Yadav 2/33) beat India 119/6 (Shikha Pandey 23*, Deepti Sharma 22*; Katherine Brunt 2/21) by 41 runs. After winning the ODI series 2-1 against England, India skipper Smriti Mandhana won the toss and invited the English eves to bat first at the Barsapara Cricket Stadium in Guwahati. Mandhana led the Indian team in the absence of regular T20 skipper Harmanpreet Singh who is nursing an injury. 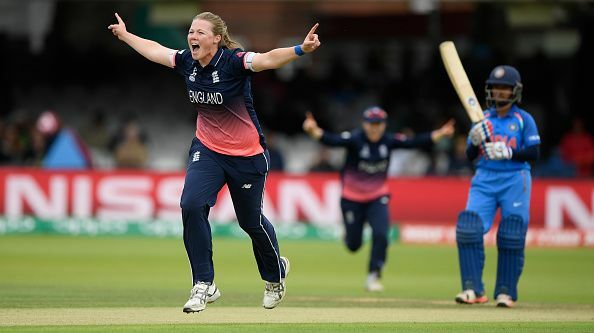 The Indian bowlers couldn’t vindicate their skipper’s decision to bowl first as the two England openers Danielle Wyatt and Beaumont added 89 runs for the first wicket. Shikha Pandey managed to pick up the first wicket only in the 12th over when Wyatt was caught by Mandhana for 35. Radha Yadav then got rid of Natalie Sciver (4) a couple of overs later reducing England to 95/2. However, skipper Knight and Beaumont then added 59 runs for the third wicket to take the visitors to an impressive score. Knight got out after a quick-fire 40 off just 20 balls while she was soon followed by Beaumont (62) in the final over of the innings. Katherine Brunt and Lauren Winfield remained unbeaten in the middle as England ended with 160/4. Chasing 161, India had a terrible time from the initial overs. Debutant Harleen Deol was the first batter to get out as she got caught behind of the bowling of Brunt in the third over. An over later in-form Mandhana and Jemimah Rodrigues were picked up by Linsey Smith in back-to-back deliveries to push India on the back foot in the chase. Mithali Raj also followed them soon in the ninth over leaving India reeling with the scorecard reading only 41/4. The hosts failed to recover from the early damage and lost two more wickets before the end of the game. Two wickets each by Brunt and Smith restricted India to only 119/6 in 20 overs. Beaumont was adjudged the player of the match for her sensational knock with the bat and a couple of catches behind the wicket.